What's everyone doing for Turkey day? Are you cooking? I am I do every year. I actually enjoy it very much. I didn't' add desserts to this round up, well because I don;t know what they will be. I put my mom in charge of that and she will be surprising everyone. That sounds good to me! I can't wait to see what she brings to the table. Yum! 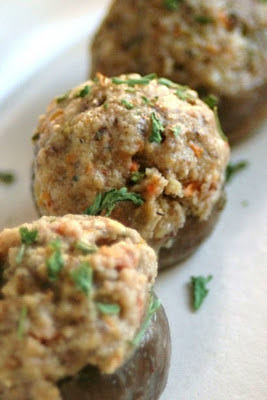 My old roommate would love those stuffed mushrooms. Those almonds look great! I was wondering if you'd be interested in doing a blog button swap? If your interested you can email me at TheCraftySideOfSarcasm@gmail.com or just grab my button from my sidebar and let me know so i can do the same. Happy Monday!